There is a certain beauty in seeing a movie that was filmed in a place you know well, maybe even call home. Many people feel that brief thrill and pride in recognizing local landmarks and favorite hangouts. However, that experience is completely foreign to most Basotho. Until now. The Forgotten Kingdom is the first full-length feature film to be shot in Lesotho. The movie tells the story of a young Masotho named Atang living in Johannesburg and estranged from his homeland. He begrudgingly returns to Lesotho to bury his father, but gradually reconnects to his country through old friends and new acquaintances who teach him the value of Lesotho. There is more to the mountain kingdom than first meets the eye. 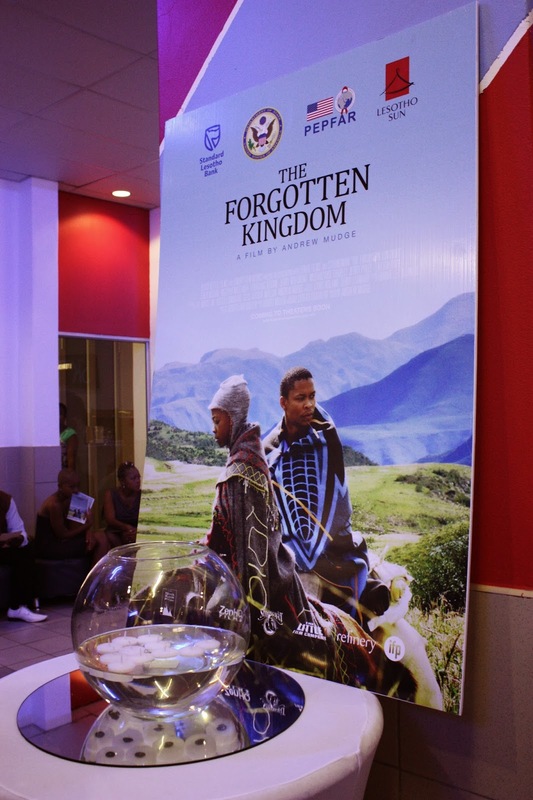 On the first of March, The Forgotten Kingdom premiered in Maseru. The debut screening was an event studded with stars, VIPs, and a theater filled with Basotho eager to watch a film not only about their nation, but in the Sesotho language. In the days following the premiere, the director and a team of crew began touring around Lesotho – returning to the communities where the film was shot and sharing the finished product with hundreds of Basotho. TTL has supported this project and helped coordinate the screening to take place tonight in Phuta and tomorrow in Mokhotlong camp town. In return, our Managing Director ‘M’e Nthabeleng was invited to attend the premiere in Maseru; she knew little of what to expect that evening. ‘M’e Nthabeleng, tell us about The Forgotten Kingdom. What did you like about the movie? For me, I really appreciated that the movie is in Sesotho, so it’s easy for many Basotho to understand. This is such a great opportunity for Basotho to connect with their stories and country. Some of our Basotho actors were a part of the movie, which also makes me so proud. This was really a movie about Lesotho and for Lesotho. How did the movie portray Lesotho? Do you think this was accurate? I think it showed many different parts of the culture of Lesotho – you could see people working in the fields and the traditional dress and dances – and the landscape in different areas of the country. It showed what Lesotho is really like. Part of the movie showed some people’s real response to HIV – the stigma in the rural communities. The father’s shame over his daughter’s illness forced him to move to an entirely different part of the country. Even though the stigma is lessened today, it remains a problem. Fortunately the movie also portrayed the support systems that exist in Lesotho for HIV+ people. There is education available and clinics that can help provide treatment. That was really important to show. Would you recommend the movie to your friends? Yes – that’s an easy one! Describe your reaction when you first saw the VIPs. I was sitting in the audience and all of a sudden, voilà! One row behind me was sitting the Prime Minister and the royal family, which showed how important the movie is to Lesotho. It was a really great moment and one I was not expecting. I had never been to that slick movie theatre before – every time I’m in Maseru I’m so busy I never have the opportunity to relax and enjoy the city. This gave me the chance to enjoy my capital city, meet some actors (and take pictures with them! ), and feel proud of Lesotho. Who were you most excited to see/meet? I was most excited to meet Zenzo Ngqobe (who plays Atang) because I had seen him in other TV shows. Also, the little boy (Lebohang Ntsane) because he did such a great job in the film. Oh and don’t forget Lillian Dube. Everyone, really! What was the best part about the entire evening? Oh my gosh, at one point while I was trying to take a picture with Zenzo I knocked over one of the waiters and broke a whole tray of glasses. He kept asking if I was okay, which I was, but I was so excited I forgot to help clean up! It was so nice to have a night out and meet celebrities and hang out with friends. Also the food was so good. I want to thank Andrew Mudge (the director) because this is a really life-changing experience for Basotho, especially in the rural areas. For an American to make such a beautiful movie about Lesotho and then bring it to show the Basotho shows real love and respect for the culture. He could have made and produced this movie and then only showed it in America. I feel, on behalf of the full Basotho community, I should extend thanks. I am really touched.